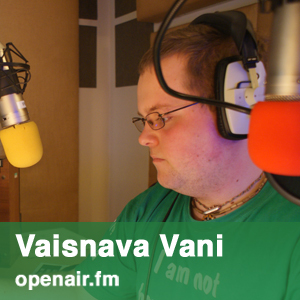 Vaisnava Vani offers the perspectives of the “Hare Krishnas”, or Gaudiya Vaisnavas, to everyone, through transcendental music, philosophy, and culture. The Hare Krishna movement was founded over 500 years ago by Sri Caitanya Mahaprabhu in India. He led a revolution in devotion and love for Lord Krishna, the Supreme Personality of Godhead. Modern ISKCON (International Society for Krishna Consciousness) attracts followers from all walks of life and from allcorners of the globe. For many people, their only idea of the Hare Krishnas, is that of clean shaven young men distributing books and singing in the streets clad in saffron robes. Vaisnava Vani seeks to offer the perspective of a young Krishna-devotee student (Bh. Chris Diamond) from SOAS, on this religious tradition. This show will appeal to those who have a keen interest in philosophy, Vedic history, Vedic scriptures, Indian culture, and a desire to learn more about this often misunderstood movement that is part of the oldest culture known to man, Vedic India.